Steamboat or more accurately, a charcoal-fuelled hot pot is the festive favourite bill of fare for Chinese New Year for Executive Chinese Chef Wong Wing Yeuk of Shanghai Restaurant. The affable chef revealed this interesting nugget during the Q&A session with media and bloggers after we had savoured a selection of his classic Shanghainese creations to welcome the Year of the Rooster. Starting from RM238 nett per person, Shanghai will be offering both set and a la carte menus throughout the festive celebration until 11 February. Richly furnished in red and gold hues, Shanghai is an exquisite haven for Shanghainese cuisine by Chef Wong. The chef explains the restaurant’s Yee Sang is specially created to cater to local custom as the dish is non-existent in China. 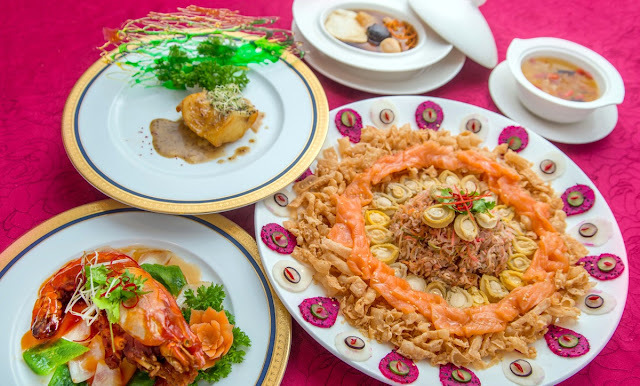 For those who wish to lou hei, the festive salad can be accompanied by a choice of abalone, salmon, lobster, sea urchin, octopus or fresh fruit strips. Although the various colours appeared muted in Shanghai’s version of Yee Sang those served at some Chinese restos, we spotted fresh grapes with strips of rose apple, musk melon and snow pear instead of pre-packed crisps in striking hues. It was the sauce that caught our imagination with zingy bursts of wasabi making its presence felt on our palate. Inspired by the Japanese sashimi-eating practice, Chef Wong had reinterpreted the shoyu and wasabi combo as the premise for his titillating Yee Sang sauce. 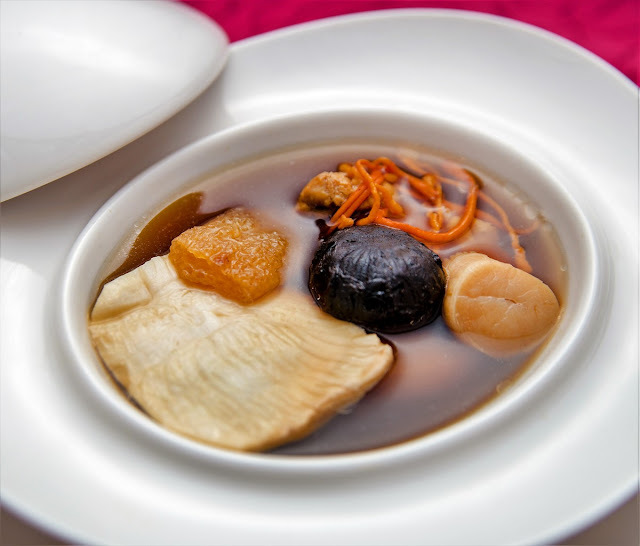 His inclusion of ‘fermented’ black garlic also brought surprisingly complex depth to the Double-boiled Superior Fish Maw Soup with Black Chicken and Cordycep Flowers. Interestingly, black garlic is produced by ‘fermenting’ whole bulbs of fresh garlic in a heated, humidity-controlled temperature environment for up 30 days. Then the bulbs are left to oxidize for 45 days, turning the garlic black and soft, tasting like balsamic vinegar or soy sauce with mild prune-like sweetness. A spot-on description for the soupy tonic we imbibed albeit much more salubrious from the pricey ingredients such as dried scallop, fish maw and bamboo pith in it. An intoxicating whiff and accent of brandy was discernible the instant we bit into the chef’s signature Pan-fried Cod with a touch of Brandy. That flash of boozy warmth and subtle gingery hotness served to amplify the natural fish sweetness, transforming it into a gastronomic delight. The enticing muskiness of black truffle stealthily reached our nostrils way before plates of Shanghainese Seafood Noodles with Black Truffle Paste hit our table. Despite the noodles plain Jane appearance, the eventual taste was anything but. Hand-made by Chef Wong, the silky strands was suffused with soul-satisfying nuances bestowed by a stock base of Chinese ham, old chicken and lean pork used to cook the noodles. Naturally, no visit to Shanghai would be complete without a sampling of its famed Steamed Shanghainese Meat Dumplings or xiao loong bao. We admired the dumpling’s translucent skin which was sturdy enough to hold its catchment of broth without bursting before we savoured it. This dainty offering paved the way for Chilled Cream of Sago with Seasonal Mango & Pomelo accompanied by sticky-chewy slices of Pan-fried Glutinous Rice Cakes with Sesame Seeds to ensure our preview finished on a positive note. For reservations and enquiries, please call Shanghai, tel: 03-2719 8288. Address: Level 1, JW Marriott Hotel KL, Jalan Bukit Bintang, KL.